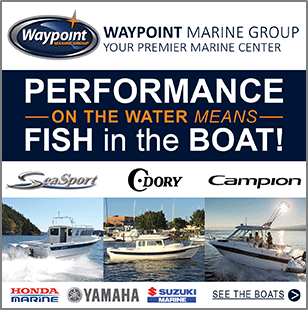 The Bellingham Puget Sound Anglers (PSA) annual salmon derby took place this last weekend. Fishing for hatchery Chinook was anywhere from red hot to ice cold depending on where you were. Kings aren’t all over the Islands right now, but if you land on them, it can be very good fishing. Hootchies, spoons and bait have all been working. Doug Marr took the $7500 first place prize with a 26.10 lb clipped fish. 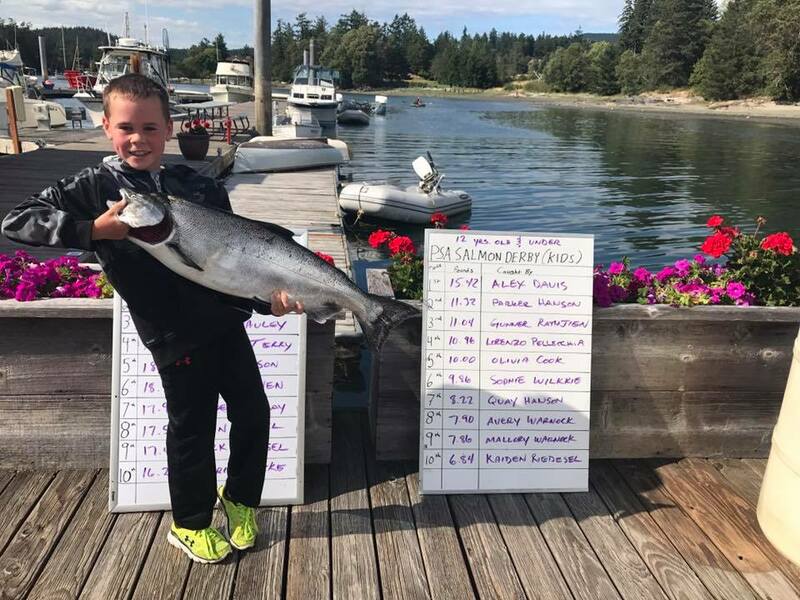 Alex Davis landed the biggest kid’s division Chinook at 15.42 lbs. 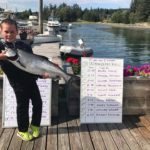 The Bellingham Salmon Derby has always been a fun, family friendly event, with proceeds going to a lot of great causes. 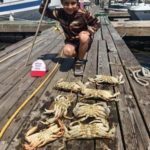 Crabbing kicked off on July 15th. It’s been pretty good from most reports. Look for days with soft tides, or drop for a couple hours during a tide change. Dropping pots on a low and letting them soak into the flood can be productive. Our weather has been pretty darn good, and adding some Dungeness into the mix truly makes it feel like Summer is here! Alex Davis showed up on top of the Kid’s division again with this 15.42 lber. Nice job young man! 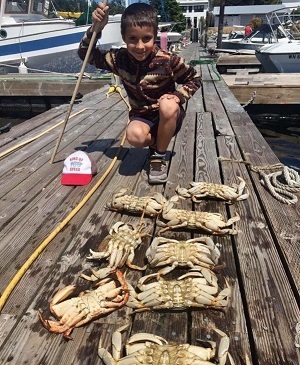 Oliver Marica and family got a crab feed going on the open July 15th. It’s Dungie time! FINALLY IT IS OPEN! The nets were flying this Sunday from Browns Bay to Port Townsend as Area 9 opened for Kings. Reports came in heavy. The White Lightning Coho Killer is BACK with many bottom bouncers picking up their limits “in the mud” in 100-120 feet of water. 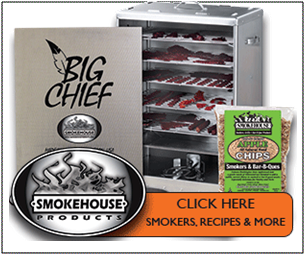 Also the “two-faced” cookies and crème coho killer (the one with the red eye) was also noted in a few reports. It won’t be open for long, so get out on the water, enjoy the sun, and hunt for that yummy 20 pounder ! 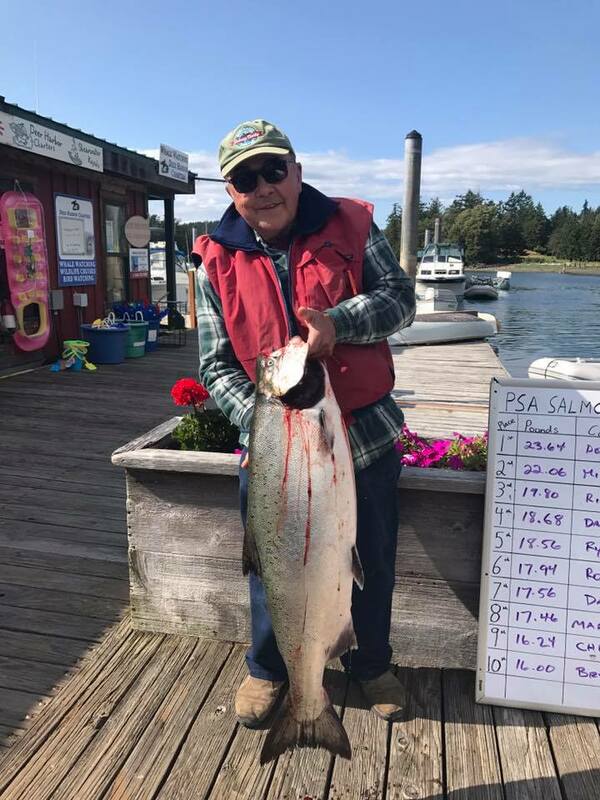 Molly, Karen and Tyler came all the way from INDIANA to land their first ever Salmon while trolling the deep waters off Port Townsend while Terry stayed close to home and nailed his high teenerwhile trolling the shallow waters off Browns Bay. 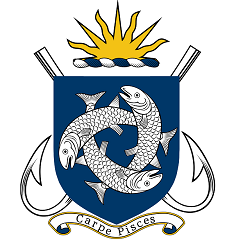 “Fish where the fish are and not where all the other boats are,” he noted! 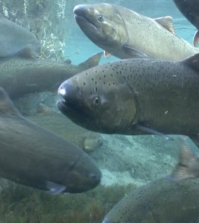 The Chinook salmon fishing has produced 54 fish in July that have been taken have come from the Girl Scout Camp, Pt. Dalco area, and the Clay Banks mostly trolling flasher and artificial squid or spoons. Typically it will be a little slow the first couple of weeks of July and start picking up in late July and on into August. Resident coho have been caught at Pt Evans and Pt Dalco with a few pinks mixed in. Also, there has been a few resident Coho being caught around the Pt. Fosdick area tight on the beach with light gear and these fish have been running 3lb to 4lb and a lot of fun on light gear. The past few days we had my son Matt and his family over for some warm weather fishing. Saturday we fished way up in the dunes past the high dune catching only one largemouth. In the evening we fished bays in Lynn Coulee and caught and released several smallmouth. Sunday and Monday we fished a smaller lake below the dam had very good luck using drop shots. I had a little bad luck last Friday. I fished the lake myself and had no luck. In untying my boat to put it on the trailer my cell phone fell out of my pocket never to be seen again. Any of my friends that have my phone number call me so I can retrieve my contacts. The level of the lake is still dropping and will continue until late September. Salmon fishing was GOOD this past week when it wasn’t blowing too hard. There have been lots of salmon coming in from Aldridge Point to the Trap Shack. Besides springs into the teens, more pinks have also been showing up. The best depths to fish have been from 40 to 70 feet. Anchovies are now the most popular bait. Good teaser heads have been the Bloody Nose and Mint Pearl. Trolling Skinny G spoons on a 36” leader has been working great. The best color combinations being Nickel/Blue, Nickel/Gold and Bananas. For flashers, the Homeland Security and Raspberry Jelly have been working well. Anglers casting of the rocks are also getting into some nice fish. 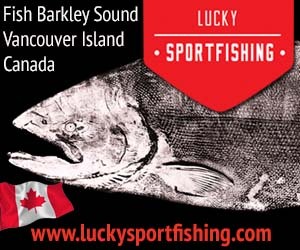 Edison Frando landed a 23 lb 7 oz spring on July 15th while casting from the rocks at Beechey Head. Salmon fishing was SPOTTY in Oak Bay this past week. There has been some good-sized fish pushing 20 lbs coming in from the flats and the Gap. 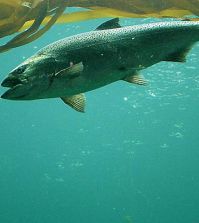 Anglers jigging have been catching way more salmon than those trolling. Good jigging lures have been Point Wilson Darts, GIBBS Minnows and the Delta Mac Fish. The salmon are feeding on needlefish and have been at depths from 65 to 135 feet, depending on where the feed is located. 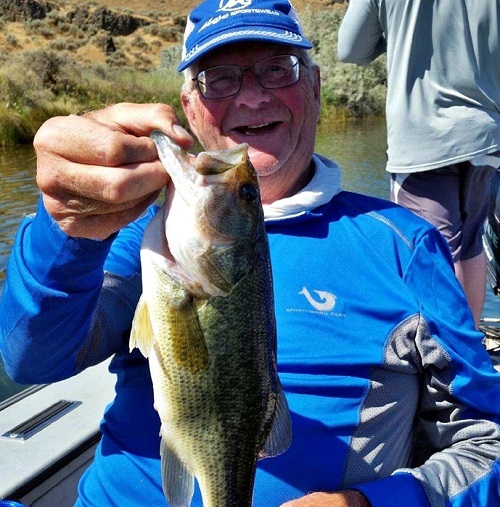 Most of the anglers have been either bottom bouncing or jigging close to the bottom. 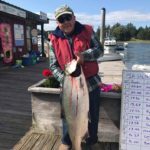 Pedder Bay Marina reports PRETTY GOOD salmon fishing. The bay was fishing well again this week, and it was out of the wind as well. The most productive area for trollers has been the can buoy. Trollers are doing best trolling from 45 – 70 feet on the downrigger and/or just off the bottom. The area from Church Rock to the Bedfords has started to pick up as well. Jiggers were doing better than the trollers and have been fishing near the Race. There hatchery springs have been running from 8 – 15 lbs. Anchovies are now the most popular bait for trollers. Good teaser heads have been the Bloody Nose and Mint Pearl. Spoons are also producing well, especially the smaller ones around 3.5”. Needlefish spoons worked the best with Skinny G’s, Left Coast Hammers, AP Tackleworks needlefish and Coho Killers the ones to use. Hootchies and squirts with a green and glow, or UV white have been popular color choices this week. Flashers that are popular include the Madi, Bon Chovy and Betsey. Salmon fishing was “THE BEST IN 30 YEARS” in the Sidney area. There have been fish coming from all areas and anglers both jigging and trolling have been getting limits of springs into the 20’s. Most anglers are releasing lots of 8 to 12 lb fish while waiting to hook the bigger ones. 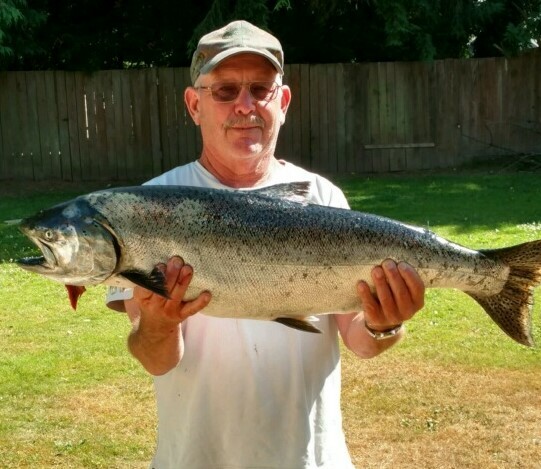 Terry Finnigan caught 21 and 22 lb springs while jigging near Sidney Spit on July 16th. Anglers using spoons found Coho Killers, Gibbs Needle G and AP Tackleworks needlefish spoons the most successful spoons this past week. Suggested colours are Trap Shack and Bon Chovy. Anchovies and Tiny Strip were also good producers of fish with teaser heads in UV Purple. The salmon fishing has been VERY GOOD over the last week when it wasn’t blowing too hard. Secretary Island to Otter Point has been good for to springs ranging from 8 – 34 lbs. The ending of the maximum size restriction has pleased all anglers and several fish in the 30’s were reported. 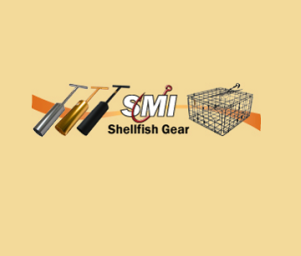 Most anglers are fishing for springs are using bait with anchovies being the most popular choice. Lots of small squid were in the area so hootchies are also effective. 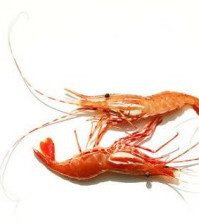 Good choices for teaser head colors Red, Tiger Prawn, Glow chartreuse Tiger Prawn and Bloody Nose. For flashers, the Delta Homeland Security and Red/Silver Hot Spot have been working well. Hootchies in all White, Glow/Green and Purple Haze have been effective recently as well. Spoons have also been catching salmon and Coho Killers and Skinny G’s have been good. The pink fishing has also been picking up and they are being caught both inshore and offshore. Fishing for salmon was SPOTTY off Victoria this past week when the wind didn’t keep you off the water. The most productive area again was Constance Bank and further out. The area from Albert Head to Trial Island has been slow. Most boats fishing the waterfront came up empty. Some pink salmon are also starting to be caught offshore. Spoons have been very successful in getting hook ups, Nickel/Blue Skinny G’s and Blue/Silver Coyotes, Coho Killers, 3.5” Cop Car spoons have brought some hookups.